Alright I have FARR on a second harddrive and I installed it using the portable install and I'm trying to add the folder F:\Scripts folder to the searchable folders. whenver I type in p it gives me that error. Removing the F:\Scripts folder from the searchable folders database makes the error go away. Any ideas? I'm guessing there is a file in that directory that has a p in its name, that is somehow "evil"
Can you check the files in that folder, and look for one that might have a messed up date stamp, or messed up icon, or something else in it? If there are a lot of files, you might try moving half of them out of their until you find the offending file (assuming i'm right that it has to do with a file that is somehow odd). so I found the offending file, luckily there's only 5 scripts in the folder so it was really easy. But it doesn't appear to have any strange attributes. can you zip and send me the batch file, assuming it's nothing sensitive? Gmail wouldn't let me send the zip file so...here it is as an attachment. It's nothing special so I don't care if people see it. how strange, no error here when searching for it.. i wonder what it could be.. i've never seen this kind of problem before..
i might have to send you a debug version of FARR to help us pinpoint the place in code that it's dying. Woah, so I changed it back and error again....I have no idea man haha. Well I have a work around at the moment. It's currently named headphones! and no error haha. 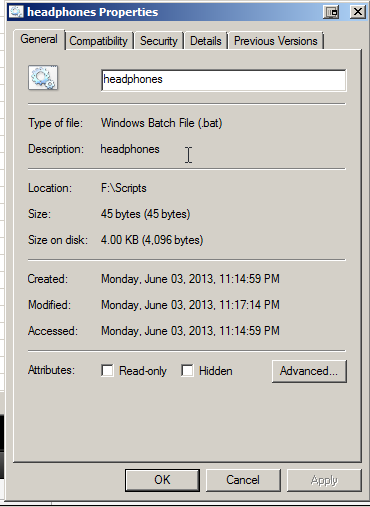 Is it possible that there is NTFS ADS (Alternate Data Stream) content peculiar to/attached to the file named F:\Scripts\headphones.bat , and that there is something wrong/corrupt with the data in the data stream? Any ADS content is lost if a file is transferred to a non-NTFS medium - e.g., it would not necessarily copy into a .zip file unless you had specifically bundled it with something like xplorer² "Bundle to go" function. Have you tried deleting or (better) expunging the file F:\Scripts\headphones.bat, and recreating it afresh, and then seeing if the error repeats? Ok i'll be sending you a debug version -- i'm dying to learn what causes this.. Page created in 0.025 seconds with 43 queries.